The role of learning in our lives is vastly beyond our common conception. Everything we think, know, and believe, we learn. Our knowledge, skills, habits, attitudes, values, and ideals are learned. What aspect of yourself, your family, your culture, your society wasn’t shaped, if not determined, by learning? Contrary to the above, learning is much more than acquiring or remembering knowledge, skills, behaviors, and experiences. 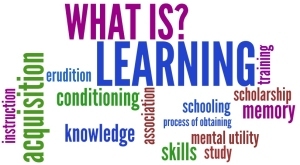 Learning is the central dynamic of our health, personal achievement, relationships, jobs, economics, and politics – it’s the core exercise through which our intelligencesphysical, spatial, sensory, kinesthetic, emotional, cognitive, linguistic, social, spiritual... develop. For each and all of us, learning affects everything about how we know and experience ourselves and the worlds we live in. Learning is the central dynamic through which humans progress from new born infants to geriatric adults. The following are other words for learning. The way we use them (and many others) obscures our appreciation for learning. This limiting definition must change.